Ryan's Story . . .
“All I ask is listen to our story. Whether you’re pro or anti, listen to what happened…and listen to your gut. ​Take Ryan’s story…like I said, I’m a real dad. I’m not made up and neither is his story." Video recorded September 8, 2017. 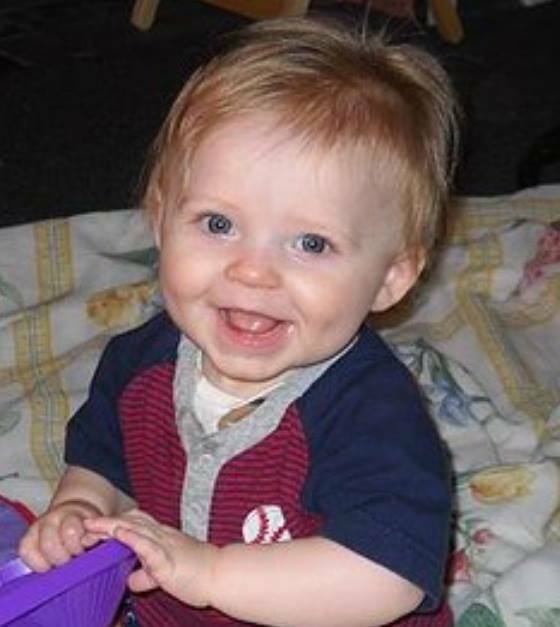 ​Ryan Johnson from Nashua, NH died on October 31, 2011 following his routine vaccines at age 15 months. His parents still grieve. They always will. And in the midst of their grief they have to put up with other's negative comments about protecting their new son, Drew from vaccine death. "Willing to bet any of you that are complaining about unvaccinated children would feel totally different if you were in our shoes. "How about getting a call from your wife hysterically saying your son was found dead? "How about being the first one to arrive at the hospital just to be told they are doing the best they can for your little boy? "How would you feel going in the room while they were working on his lifeless body while you were holding his hand telling him to please come through this? "How would you feel if you have to make a decision when to stop resuscitation on your little boy's life? "How would you like to hold your son's dead body in your arms to sing him his favorite lullabies one last time before they bring him for an autopsy to butcher his little innocent body? "How would you feel the next day while you were picking out his little casket and the Medical Examiner called you to tell you that physically he has been one of the healthiest looking specimens she has ever worked on? "How would you feel when 7 months later you are told that they cannot find a reason why your son died? "How would you like to live everyday knowing these facts? "Your healthy baby boy who was never sick and never had any infections of any kind is now dead, less than 72 hours after receiving 6 vaccines. "And again, other than that there are no facts. Except that no cause of death was found in his autopsy. "Now put yourself in our shoes and tell me you wouldn't feel differently. "I really hope none of you have to go through what we have been going through." "It took 11 months to get pregnant. Ryan was a happy baby even laughing out loud at 2 weeks old. On Friday, October 28th he had his 15-month check up and received 4 shots the DTaP, HIB, flu and pneumococcal conjugate, he cried like crazy. That night he was cranky but slept through the night. The next day he was ok but it seemed that his leg was hurting I didn't think anything of it. "On October 31st, 3 days days later it was a normal morning I took him to day care. I dropped him off and he didn't seem himself and even the babysitter noticed. I got a call around 2:40 it was the babysitter saying "Ryan is dead" she kept saying it. I thought it was a joke but it was a nightmare. I rushed to the hospital. Our babysitter had put him in a car seat so he was sitting up so he could take a nap but when she went back to check on him his eyes were rolled back in his head, she said she started CPR on him. At the hospital they worked on him for an hour but we had to make the decision to stop CPR as there was no chance for him at this point so October 31,2011 at 4:20 pm Ryan Thomas Johnson, 15-months old passed away. "That was just the beginning we had to go to the police station after the hospital to be questioned. I knew in my heart our babysitter did everything she could for Ryan. We still have a great relationship and she takes care of Ryan's Brother Drew.